Jack Vettriano's exhibitions of paintings have been sell out for many years. His Retrospective was a stunning display of over 100 of his paintings from his career so far. Here's an exhibition list to date. Jack Vettriano's birth name was Jack Hoggan. His early paintings were signed Hoggan. Why did Vettriano change his name and how much is a Hoggan original worth? Got Questions? Find answers to our most frequently asked questions. 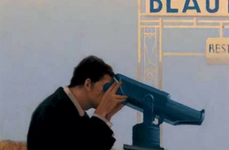 We have the UKs largest selection of Jack Vettriano Limited Edition Prints. Choose your favourite here.